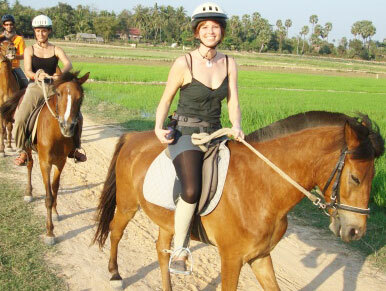 Travel away from the tourist areas and in to the heart of the Cambodian countryside on horseback and bicycle. Start with a two hour horseback ride, passing rice fields, local villages, and the remote Wat Atvea at a leisurely pace. This afternoon, pedal your way along the local river to explore rural Siem Reap and meet friendly locals. 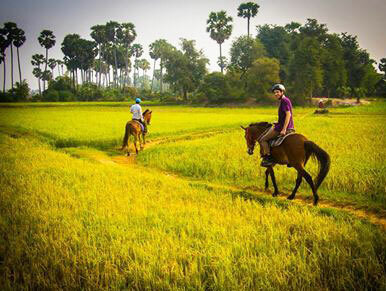 Enjoy half hour to half day explorations through Siem Reap’s surrounding countryside and temples on horseback. The experience is great for individuals or families, as there are horses suitable for all experience levels from placid ponies that are suitable for first time riders through to young lively geldings for experienced riders. Most of the horses are one hundred percent Cambodian bred. The ranch does their best to ensure you are given a horse that is most suited to your experience. 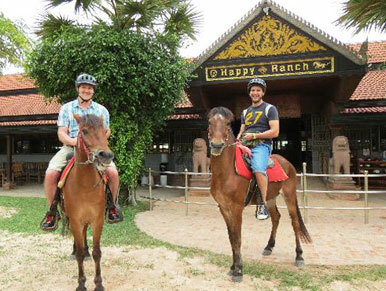 This horse riding tour is made to give the opportunity to riders to mix horseback tours, in a wonderful and exotic setting, and the discovery of world wide known sacred places of Cambodia. Angkor Wat, a wonder of the world, totally unique, opens its gates for you ! You will also have the opportunity to meet the inhabitants of the famous lake dwellings, and to marvel at the verdant vegetation of this secret kindgom.